The ideal mover for all types of heavy loads. Affordable and sturdy movement of materials. A great help around the shop, warehouse or plant operation. 3/8" non-slip tread plate. 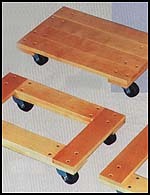 Rolls on 2 rigid and 2 swivel 4 x 2" Mold-on rubber casters. Available in steel or aluminum.